Al-Zaytouna Centre for Studies and Consultations has recently published a new book “The Shuyukh Camps: The Resistance of the Muslim Brothers Against the Zionist Project 1968–1970,” by Ghassan Dou‘ar, and reviewed and edited by Dr. Mohsen Mohammad Saleh. The 302-page book consists of four chapters and two documents and photographs appendices. It documents and analyzes one of the milestones in the Muslim Brothers (MB) movement’s history, in general, and in the struggle for the liberation of Palestine, in particular. The book reveals a lot of the mystery surrounding the role of the Islamic movement during an important stage in the Palestinian resistance, during the 1968–1970 period, which was not mentioned in the literature, writings and history of the resistance and the Palestinian national movement. To fill this gap, the author had to compensate for the lack of written information with a wide and important range of oral history testimonies. The interest of the MB movement in Palestine was present way before the partitioning of Palestine in 1947 and the establishment of Israel. Since the 1930s, they realized the objectives of the Zionist movement, and considered fighting it an Islamic cause and a strategic objective, thus they provided all their potentials and capabilities to fight it, while facing conspiracies and accusations. Chapter One discussed the ramifications of the Nakbah on the MB movement in Palestine and the results of the armed struggle of MB youth in Gaza Strip, in the first half of the 1950s. Consequently, and after realizing that the political climate does not permit any Islamic resistance activity, a number of MB prominenet leaders established an independent organization, named later the Palestinian National Liberation Movement (Fatah). Chapter Two reviewed the post-1967 war developments and the emergence of the Palestinian military organizations, especially the Fatah movement after the victory in the battle of Karamah in 1968. At that time, the public, and the Arab and Palestinian youth, were convinced that armed struggle is an alternative to the failed Arab armies. The MB movement youth pushed their leadership to make an agreement with Fatah, where the latter would allow the MB youth to train and establish their independent camps in the Jordan Rift valley, from which they would launch their own resistance activity. 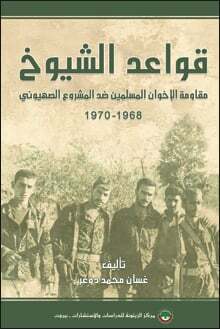 Then the author explained the phases of MB youth arms training, the establishment of eight camps and their distribution, training programs, armament, joint operations with the Fatah movement and the independent ones, those killed during fighting, the movement relations with other organizations, as well as with the Jordanian army and the public. Chapter Three explained how the specter of “sedition” peered into the Jordanian arena as a result of the conflict between the Palestinian resistance activities and the Jordanian regime, discussing its factors, ramifications and results. Consequently, MB camps leadership decided to avoid this “sedition,” and dismantle the Shuyukh camps while sending each member back to his country. Chapter Four talked about MB movment members, who were killed during their armed resistance operations against the Israeli occupation, causing severe human and material losses to the Israelis. At the end, the book has very important appendices of documents that clarify the stance of the Islamic movement towards Israel and local and regional developments, in addition to the appendix of photographs. Al-Zaytouna Centre offers Chapter Two for free download.